With more than 85 percent of the nation’s wine produced in the Golden State, it’s no surprise that California wine has its own month. On Catalina Island, wine is grown, celebrated and – of course – enjoyed. 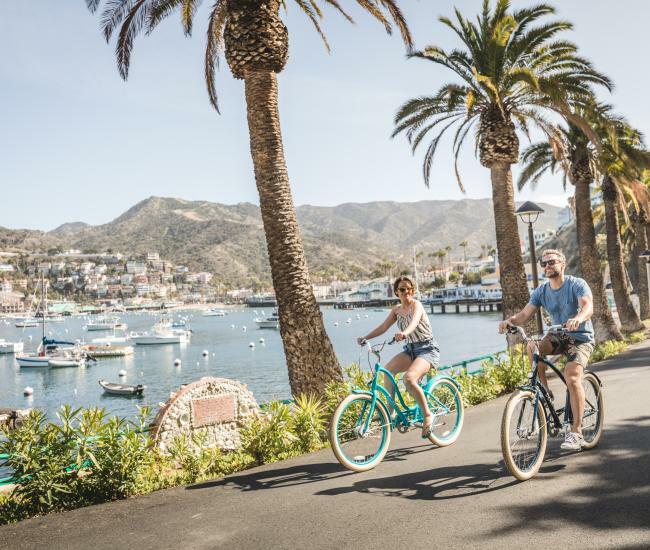 Whether you are visiting during California wine month or any other time of year, here are our nine favorite ways to celebrate wine on Catalina Island. For more than 20 years, wine lovers have flocked to Catalina Island in September to indulge at the Catalina Island Wine Festival. Featuring dozens of wines, including Rusack Vineyards, Bonterra Organic Vineyards, Trinchero Family Estates and Seghesio Family Vineyards, the Catalina Wine Festival is held on South Beach in Avalon. Appetizers and live music complete the event, which is scheduled for Sept. 16 from 2 to 5 p.m.
Made infamous by the comedic cult classic Step Brothers, staring Will Ferrell and John C. Reilly, the Catalina Wine Mixer was a fictional luxury gala known for its off-color moniker. Thanks to the Catalina Island Company, the Catalina Wine Mixer is no longer fictional. This year’s event features dancing, DJs, several concerts, a costume contest, a movie screening and – just a bit – of wine. 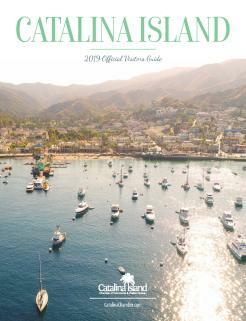 Several locations in Avalon will play host to the Catalina Wine Mixer, including the Casino Theatre, Descanso Beach Club and the Avalon Grille, from Sept. 22 to 24. Whether you are enjoying a bottle of wine with dinner or having a glass or two just to relax, wine on Catalina is easy to discover. Great wine lists can be found at Steve’s Steakhouse and Seafood, the Avalon Grille and the Ristorante Villa Portofino. The Seaport Bistro, the Lobster Trap and Maggie’s Blue Rose all offer a wide choice of wines both by the bottle and by the glass, as do El Galleon, The M Restaurant and Bluewater Avalon. Visiting Two Harbors at the island’s West End? The Harbor Reef Restaurant is a great place to grab a glass or a bottle. Many of Catalina’s restaurants offer special wine events. In September, Bluewater Avalon is offering Spanish wines to accompany seafood paella and their regular wine list spotlights several great California wines. Wine and Art – Wine has inspired art for thousands of years and continues to be the perfect accompaniment to creativity. Conjure your inner Picasso at a weekly Painting and Wine event or enjoy an Art & Wine Walking Tour, both offered through Rain Dance Art Gallery. See the vineyard -- California has nearly 600,000 acres producing wine grapes. Its wine regions can be found throughout the state and are renowned throughout the world. Nestled in the island’s isolated hills and overlooking the Pacific, the vineyard on Catalina encompasses just a few of those many acres, but the grapes it produces are a labor of love for owner Geoff and Alison Rusack. Along with the winemaker from their vineyard and winery in Santa Barbara County, the Rusacks craft highly-rated Chardonnay, Pinot Noir and Zinfandel, which are available at the Avalon Grille as well as on-line. Know your history – Like the rest of California, the Channel Islands’ relationship with wine goes back more than a century. Zinfandel grapes were planted on Santa Cruz Island, north of Santa Catalina, in the early 1800s. Prohibition brought an end to that vineyard and winery, but a few hardy vines survived the purge. When the vineyard on Catalina was planted, cuttings from those vines were propagated here and Santa Cruz zinfandel grapes now grow at the Catalina vineyard. Share a bottle – Wine on Catalina isn’t just available while out and about. Bottled wine can be purchased at several local stores. Share a bottle with family, friends or your significant other at your vacation rental or hotel room. 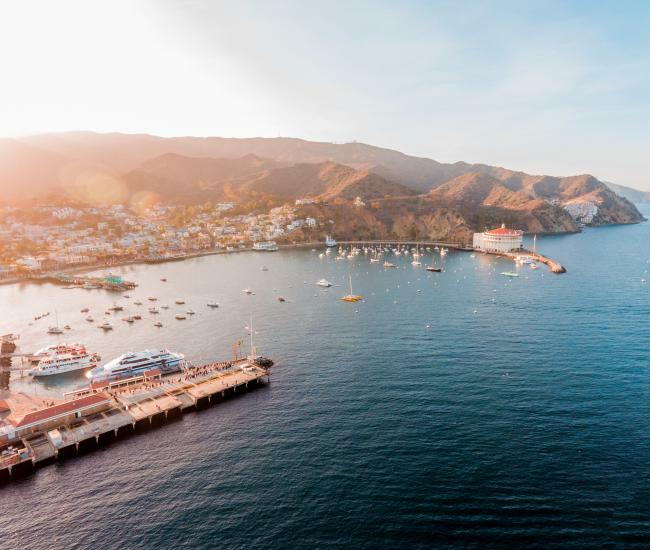 Enjoy the sunset – Catalina’s picturesque waterfront is particularly compelling as the sun sinks behind the hills. Toast the sunset – and the amazing view -- from the Casino’s spectacular promenade on the Twilight at the Casino Tour. Ready to enjoy light appetizers as well? Weekends this fall the Island Spa’s exclusive sundeck is open in the evenings for wines by the glass at On Deck @ Island Spa. 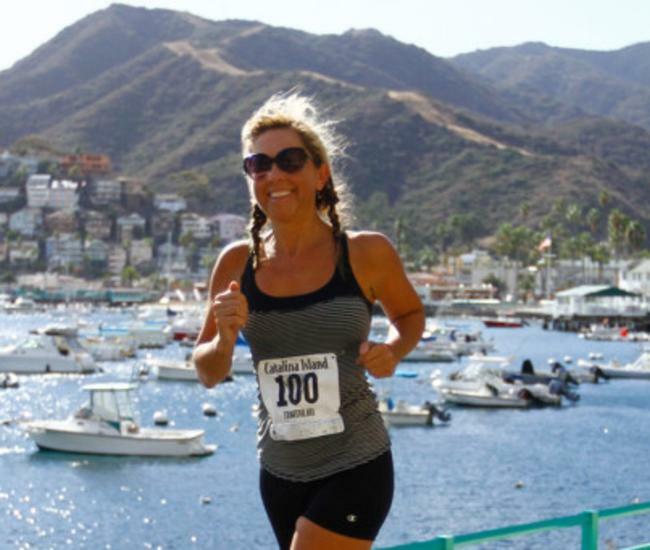 Plan ahead – Catalina wine events aren’t just limited to California Wine Month. Make plans now to enjoy the Two Harbors Summer Wine Festival, a beach-front tasting event at the Island’s West End. Held each year in June, the Two Harbors Summer Wine Festival raises funds for the Avalon Rotary Club.